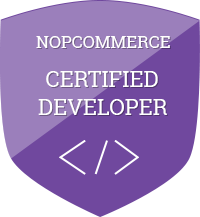 Certified developer program is a test designed to certify one's skills as nopCommerce developer, thus giving them official recognition and proof. Interested in becoming certified developer? Please read program description and details here. All certified experts are listed in the certified developers directory.